Recipe for Apple and Mint Chutney. A fresh and fragrant chutney with a bite! Goes well with fish, chicken and meat dishes and is delicious with Leg of Lamb. Recipe for Turnip Chutney. An old-fashioned chutney that is particularly good with all cold meats. Ready for use in 4-6 weeks but better if left longer! Like Pan Yan Pickle but could equally be called Apple and Date relish/chutney. Makes several jars depending on the size. No cooking involved. Recipe for Pear, Fig & Walnut Chutney. If you prefer a less chunky texture, chop everything (including the walnuts) into smaller pieces. Recipe for Old Ma Donethey's Beetroot Chutney. A very sweet chutney that is delicious with ham, sausage, pork pie, cheese and savoury snacks. 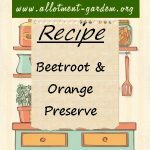 Recipe for Beetroot and Orange Preserve - an easy to make, sweet and spicy preserve that is great with cold meats and cheese. 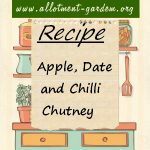 Recipe for Microwave Green Tomato Chutney. A good recipe as it is cooked in the microwave and not for hours in a preserving pan on the hob. Recipe for Marrow & Courgette Chutney. Goes lovely with cheese or cold meats. Best to leave in a cool, dark place for 2 - 3 weeks at least before consuming. Recipe for Pear & Walnut Chutney. Makes about 4 lb (1.8 kg) of chutney. Leave for at least a month to allow to mature. Recipe for Sweet Beetroot Chutney. This chutney can be eaten fresh or will keep for 3-4 months unopened. Lovely with buttered crusty bread and cheese. Recipe for Grandma's Wartime Christmas Pudding. Make in advance and keep stored in a cool, dry place. Heat through on Christmas Day in a microwave. Recipe for Danish Fruit Soup. Serve with crushed rusks, toasted oatmeal or bread cubes, apple boats or dumplings cooked in the soup for 3-5 minutes. Easy recipe for Prune, Apple and Walnut Chutney. Pour into sterilised jars and leave for at least 8 weeks to allow the flavours to develop if you can wait. Recipe for Dorset Apple Cake. An apple cake incorporating cooking (bramley apples), lemon juice and cinnamon. Lovely served with clotted cream. Recipe for Apple Cake (Torta con le mele). Torta con le mele .....cake with apples to you and me, but my Italian friend Titta gave me the recipe. Recipe for Fruit Flapjack. Perfect for breakfast on the run or in school lunchboxes. You can even pretend its healthy what with all the cereals and fruit! Recipe for Apple and Blackberry Slump. Despite the fact this has got ½ lb of mascarpone in it, a jug of custard really is a must, or cream or icecream! Recipe for Spiced Cranberry Shrub. Shrub is a name which is borrowed from the Arabs - fruit sherbet drink. Makes 4 glasses and takes 5 minutes. Recipe for Italian Bread Pudding a twist on the British. This is really easy to make. Serve warm with cream. For a skinny option you can use creme fraiche. Recipe for My Grannies Apple and Rhubarb Chutney. Leave for a couple of months, somewhere cool and dark, before eating. Great with cheese and cold meats. Recipe for Apple and Cape Gooseberry Sauce. The Raspberry vinegar is optional but it does add to the fruity sweet and sourness. Recipe for Spiced Apple Cake. Easy to make but really impressive. The spices and the apple keep the cake moist and it will last for at least 4 days in foil. Recipe for Suet-Free Mincemeat. An alternative filling for the Christmas classic - mince pies. Smells absolutely fabulous, enjoy. 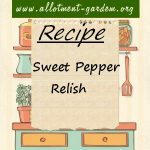 Recipe for Sweet Pepper Relish. Lovely mixed with cream cheese and spread on crackers or used as a glaze for pork and chicken. Recipe for Cranberry Chutney. Chutneys make fantastic presents because they improve with age and go brilliantly with Christmas cheeses and cold meats. Recipe for Spiced Plum Chutney. Makes a lovely Christmas gift and, if you're not a huge fan of jams, a good way to use up some plums to good result. Recipe for Wheat-Free Apple Layer Cake. A low-fat, moist cake using soya and rice flours. Nice served as a pudding with soya yoghurt. Recipe for Apple & Rosemary Jelly. Makes about 3 lbs (1.4 kg) of Apple & Rosemary Jelly. A few drops of green food colouring can be added during cooking. Easy to make recipe for Mushroom Chutney. Makes about 4 lbs (1.8 kg) of Mushroom Chutney which is delicious and won't last long on the shelf!! Recipe for Chilli Pepper Relish. A relish with attitude! You can vary the hotness by altering the amount and type of chillies. Recipe for Mustard Relish. An essential accompaniment for hot dogs. Also goes well with burgers. Makes about 4 lbs (1.8 kg) of Mustard Relish. Recipe for Blackberry Curd. Makes a great filling for tarts and cakes as well as thickly spread on bread and butter. Makes about 5 lbs (2.3 kg). Recipe for Mint Jelly. This makes a different accompaniment for lamb from the traditional mint sauce. It's really nice on new potatoes as well. Recipe for Apple Jelly. Apple Jelly is a bit bland on its own so additional flavouring is added. Apple carries flavour really well. Recipe for Spiced Rhubarb Chutney. You can substitute fresh ginger finely chopped instead of the dried if you prefer.